1. Name/Where are you from/Where do you live now? I met a pony named Aphrodite and it was love at first sight. I rode pony and junior hunters into my teenage years then sadly left them behind when I went to college at Northwestern University. There was no room for them in the dorm. I volunteer at a therapeutic riding center in Sagaponack, New York called CTREE. As editor of Equestrio Magazine and now Puissance America Magazine, I have the pleasure of telling their many faceted stories. 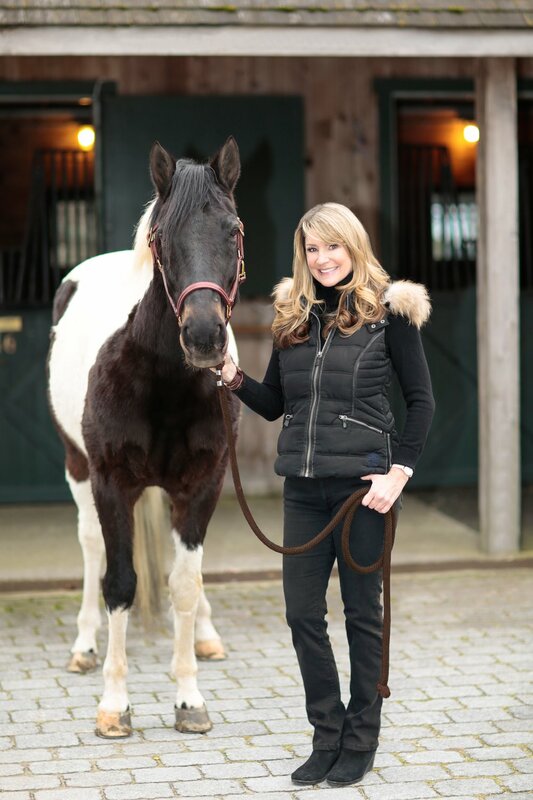 When Mark and Katherine Bellissimo took over at the Winter Equestrian Festival, they tapped into both my general marketing and writing skills as well as specific equestrian knowledge to help launch their vision. The promotional videos I produced for them are still widely viewed. As editor of Puissance America, I seek out compelling stories of horses and riders as well as the equestrian lifestyle. This is an amazing world of art, culture, travel, fashion, philanthropy and business. I work closely with the different event partners where the magazine is distributed. We also depend on advertising dollars, so I work to creatively set up strategic partnerships. While I rarely get to view the world "between the ears", I do get to travel and discover these amazing creatures and their power as well as the passion of horse lovers. It's a good day when I at least get to pet a muzzle. With a busy work and travel schedule I don't currently have a horse or pets, but I am absolutely open to dog sitting. There is an amazing grounding quality when you work around horses. It connects you to nature and the animal spirit which is important in these days of tech obsession. Horse shows are also in some beautiful settings so a day at "work" is more like vacation. I also work in the luxury lifestyle sector which is a fit with equestrians who enjoy many of life's finer pleasures when not in the saddle. I work with brands which want to tap into this demographic and it is important to understand from an advertising or sponsorship perspective the best way to authentically and effectively connect. Many of us are working more than one job so finding work opportunities is essential for success. Networking and supporting each other is essential, and there is a generous spirit in this community. Is that like asking which one of your children is your favorite? I think the expansiveness and overall experience at the Winter Equestrian Festival, Adequan Global Dressage Festival and International Polo Club Palm Beach create 12 weeks of top horse sport. Being from the Hamptons, I have a special place in my heart for the Hampton Classic which still has a gorgeous grass grand prix field. I have only been to a few of the Global Champions Tour shows but they put on a first-class experience in stunning cities. EEM with the Longines Masters brings a global panache to all that it does. Greenwich Polo also is a posh place to see the best polo players on the East Coast. I just saw an interview with the CEO of Rent the Runway Jennifer Hyman who started company-wide HR policies for all its employees whether staff positions or not. She realizes that workers benefits should apply to all. She makes the point that her moral duty to society also affects the bottom line... in a positive way. By supporting all her workers financially, with a flexible leave - say for taking care of an ill parent - she has higher employee retention and higher productivity. For many of us in the equestrian industry, we are technically freelance without any benefits so having the business owners realize that investing in their valuable workers is well worth it in the end would be a game changer. Katherine Bellissimo. We went to Northwestern University together and the lure of escaping a cold New York winter to work in sunny Florida led to a whole new career for me. Gary Chapman's The Five Love Languages. Not only is it invaluable in personal life, it also points out that we all have different motivations and taking the time to find out what makes people tick is invaluable for happiness and success. I love the print magazine world and believe that high quality content and presentation will always be valued. I also see a fiction book in my future.... more to follow. I live mostly in the Hamptons so fresh caught flounder with farm stand vegetables is a favorite. I also make a mean peach pie. I just watched Doctor Foster which is a fascinating look into revenge psychology. Call The Midwife is a favorite for all of its fabulous female characters who have become my virtual friends. It used to be House of Cards, but now reality is stranger than fiction. Favorite books: The Mists of Avalon by Marion Zimmer Bradley, The Paris Wife by Paula McLain, The Nightingale by Kristin Hannah, Me Talk Pretty One Day by David Sedaris, Bloody Chamber by Angela Carter. Favorite movies: Harold and Maude, Out of Africa, The Devil Wears Prada.